Work on China’s neighboring policies is not very extensive but some of the recent works quite exciting (see http://www.highlandasia.net/projects/artn.html and for the China-Pakistan connection Andrew Small’s work which I reviewed last year). Working in a border valley of Nepal to China since 4 years now, I could observe some of the fast developments on this side of the frontier. The valley, Langtang, is inhabited largely by Tibetans, many of whom still have some family back in Tibet and even frequently move between the two countries. With the new wealth from tourism these travels have possibly increased again. At the same time, the road that passes the valley is the second most important connector between Tibet and Kathmandu (after the Arniko Highway) and last year has seen increased traffic as the Arniko Highway was blocked (Figure 1). 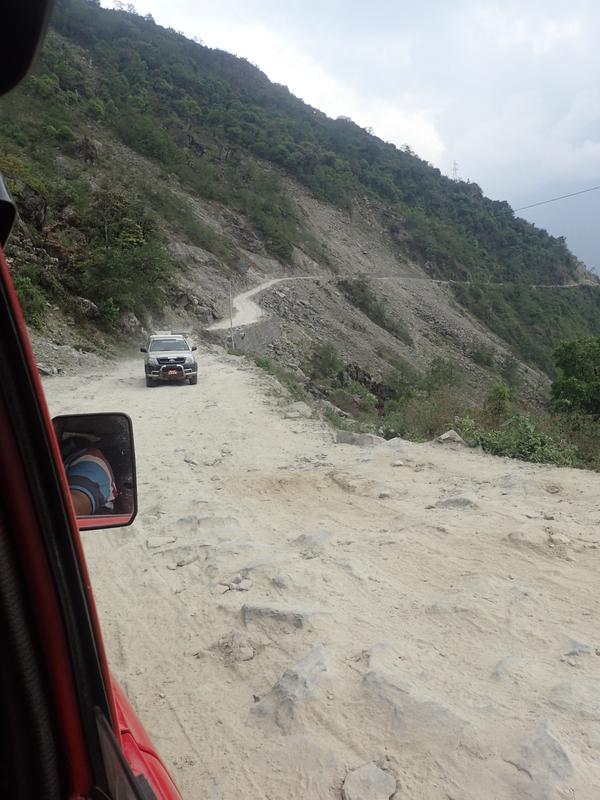 The main road between Trisuli and the border (Figure 1, Trisuli is just outside the map, and Figure 2) is in many places still unpaved and even before the earthquake was frequently blocked by landslides. Since last year construction of new roads in the area has increased – which will likely also speed up erosion – but reconstruction and maintenance of damaged stretches is difficult also with increased stress from heavy trucks. A new road is currently built from Trisuli to Rasuwagadi along the river bank. Figure 1: Overview over the border area around Langtang valley. The blue square shows the Chongsecun road blockage (Figure 3). Figure 2: A road stretch before Syafru Bensi coming from Kathmandu. Figure 3: Blocked road on the Chinese side (see Figure 1 for location). The mapping we did for this work is described on the NASA page here. 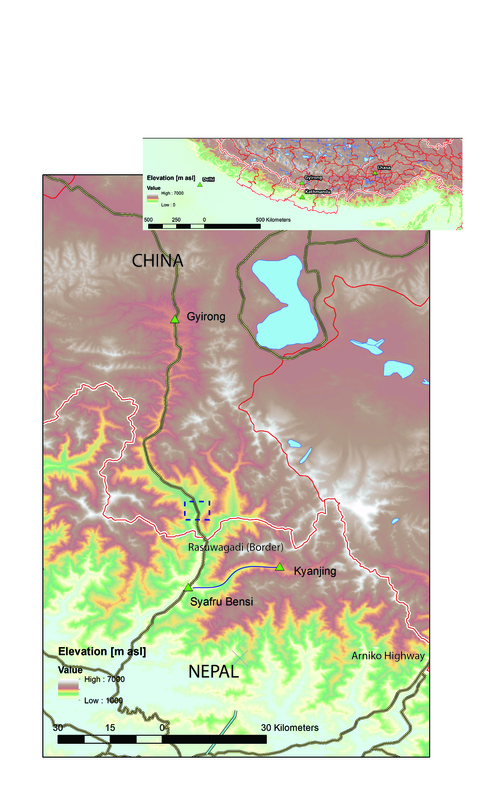 Also the Chinese side of the road was damaged during the earthquake (we documented this for our rapid response assessment here – see also Figure 3 – and published an article on the landslides in Science last year) but reconstruction likely works at a much faster speed similarly to the difference in road quality on the Chinese-Pakistan or Chinese-Indian borders. 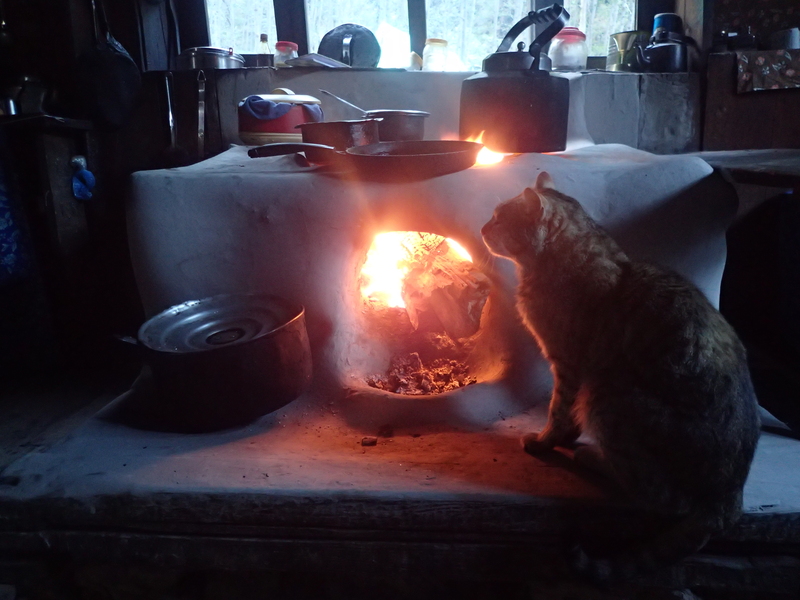 There were always Chinese goods for sale in the Langtang valley – for foreigners most notably many of the “local Tibetan handicrafts” that are ironically produced in China and brought over the border by locals while visiting family – but this seems to have increased recently. Even though transport is longer than from Kathmandu or even Northern India, the fact that the road is better (and possibly safer) seems to favour this. 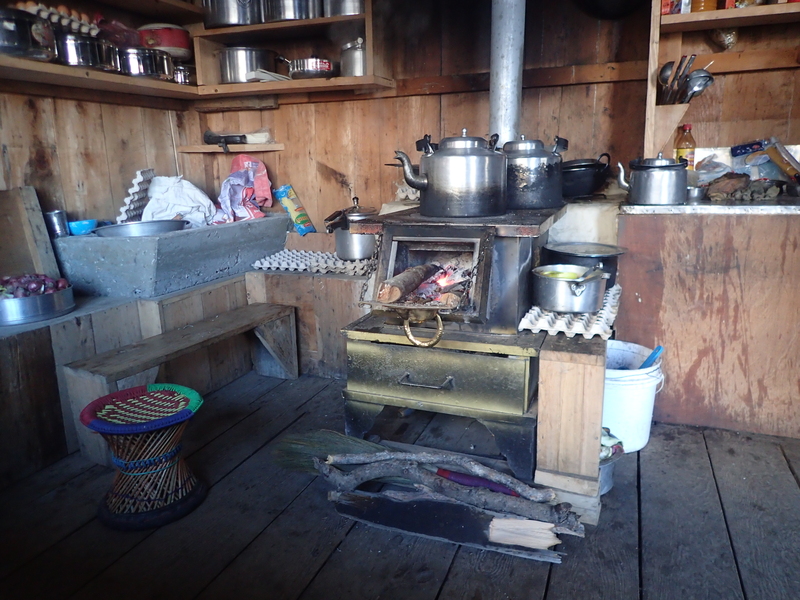 This spring new ovens were transported to Kyanjing to a large number of households and in one swoop the old earthen ovens were replaced with metal ones brought from Gyirong to Syafru Bensi (1500 m asl) by truck and then airlifted by Helicopter to an elevation of 3900 m.
Figure 4b: The new metal oven brought from Gyirong, now supplied to most households in Kyanjing. Back in Syafru Bensi a large number of trucks is often waiting until they can cross the border. One main good that is being brought from Tibet to Kathmandu are Apples. I’d be curious to learn where they are grown and how transport from Gyirong onwards works. All Nepali trucks just drive to Gyirong where they load goods and return. 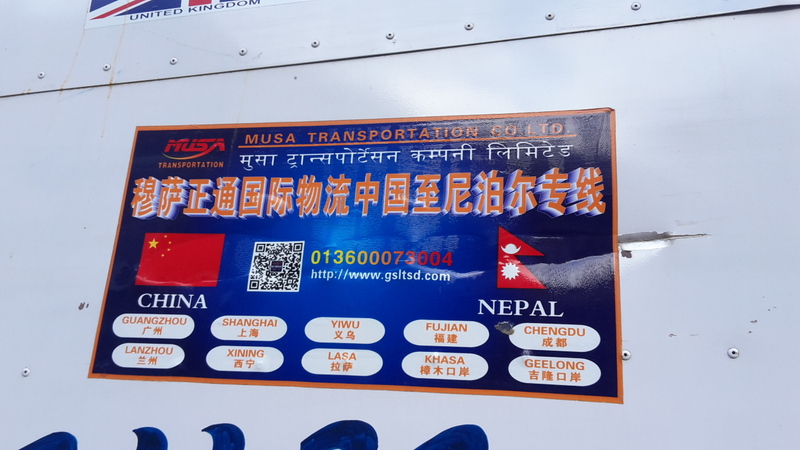 No Chinese trucks enter Nepal, contrary to Indian trucks coming into Nepal and in Tajikistan where Chinese trucks enter the country up to the first transfer station. Companies like Musa Transportation (Figure 5) remind me of the trade networks Magnus Marsden describes in his excellent book Trading Worlds. The Nepali trucks destined for Chinese goods are sealed and often painted with Chinese text (often just saying zhong guo or peng you) and flags (see images below). I would like to understand better to what degree the leverage China has in this trade game over India is influenced simply by price and to what degree by the capability to maintain the necessary transport infrastructure and legal frameworks. While large scale political studies help to understand the larger picture, more local accounts (like the ones collected in the highlandasia project or I hope to come see forward from Edward Simpsons Roads project) are crucial to understand these processes. Figure 5: Logo on one of the trucks in Syafru Bensi.